This has got to be one of the easiest recipes I have. And you can make it with cooked chicken, beef, turkey and even wild game! Cook your meat of choice and drain the fat. Set aside. I used ground beef this go round. Velveeta cheese, stir until cheese is melted. Stir until all the ingredients are blended and smooth. You may need to add more milk if the mixture seems to thick. Stir in your cooked meat. Serve over a bed of rice, tortilla chips or pasta. Have a great and delightful day!! This looks delicious, Amy. I am needing some inspiration for some good dinner meals; I will have to make this up for everyone. What's your favorite way to have it, over rice, or chips or pasta? 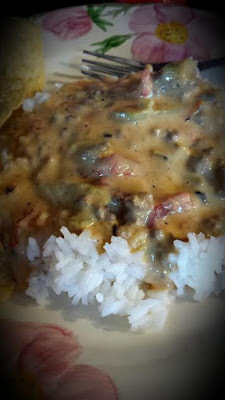 Pam, I love this served with rice the most, but the boys love it with chips (kinda like a fancy nacho). I hope you give it a try! Thank you for leaving me a comment, they always brighten my day! My 16 year old son got his first deer Saturday, opening day, one hour after opening time. He was so excited! I've never seen him like that. I'd love it if you'd share any venison recipes you have. I've never cooked it. Ohh, this is such a yummy dish Amy! I make it like NanaDiana, in a dip where you dip warm tortilla chips in it. Amazing! It is great that you can use it for a main course too. Yum!!! How is the weather in your part of the world? Heard that CO got a lot of snow. Hope you are all enjoying it, and that it has not caused you any problems! Take care my friend, and have a blessed day! I just made this for dinner; we're about to eat. Num Num.